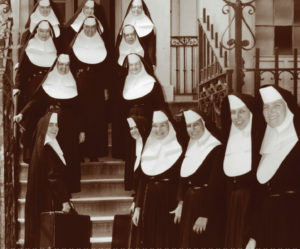 Mercy education has a long and rich history. One finds its roots in Ireland in the ministry of Catherine McAuley, the founder of the Sisters of Mercy, and her coworkers. Mercy education, faithful to Catherine’s legacy, continues into the present. To assist in orientation and ongoing understanding of the journey to Mercy Education System of the Americas, these moments in the journey are noted. A full historical record is on file at the MESA office. “The task forces, chairs and members have been named for five of the task force groups. I want to thank all those who were able to say “yes” to serving on these groups…” Sr. Lisa Griffith. “Let us together in a spirit of mutual collaboration, love of Mercy, and hope for the future bring together one Mercy education system, belonging to one Institute, marked by fidelity to the charism of one foundress, Catherine McAuley, committed to the gospel and in service to the Church. For the journey we ask Catherine’s blessing.” With these words, on Foundation Day 2014, the Institute Leadership Conference set forth with all in Mercy Education to forge what would become Mercy Education System of the Americas.